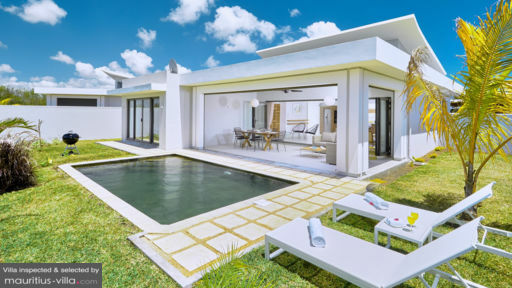 Set in the scenic North-West of Mauritius, Villa Corail Bleu is designed to enhance your holiday in Mauritius by providing you with opulent comfort and luxury. Set in a large emerald green garden, this villa neighbors other holiday homes that can be rented by your friends, should you wish to enjoy an extended vacation under the sun. Because the villa is so aptly located, you can be sure that you’ll never run out of things to do in the neighborhood. Villa Corail Bleu is equipped with three bedrooms. All the bedrooms come with an air conditioning unit as well as a ceiling fan to deliver an excellent night’s sleep, regardless of the climate. The bedrooms also come with an en-suite bathroom each. In the master bedroom, you’ll also find a digital safe, dressing area, king-sized bed as well as an LCD TV. This bedroom leads to a private verandah. The two guest bedrooms come with a double sized bed and a king-sized bed respectively. With only a short distance between the public beach and the villa, visitors will be able to enjoy the Indian Ocean for as long as they’d like to. Indeed, the picturesque beach of Bain Boeuf is a mere few meters away from Villa Corail Bleu. 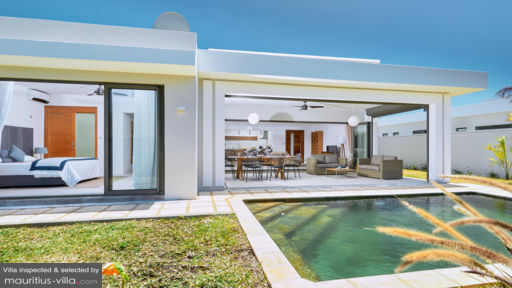 Outside, you will also find that the villa has a shared pool in the common area, along with a private pool which you can enjoy in the privacy of your own tropical garden. While there’s plenty of shade, visitors will also find several spots which they can use for sunbathing, thanks to the loungers that have been arranged all over the compound. Outside, there’s also a Weber Barbecue Set which would be ideal for entertaining. There’s also an external dining area for fun tropical nights out with your loved ones. 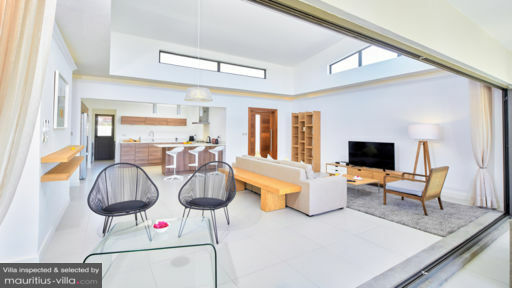 The living areas of Villa Corail Bleu are designed to feel just like home, with a spacious living room that opens on the emerald green garden. In the living room, you’ll find an LCD television, with satellite channels so you can keep in touch with international news. The entertainment system also comes with a music system. The living rooms open on a veranda which is sheltered by a bamboo screen. At Villa Corail Bleu, the kitchen is fully furnished, with a double-door fridge, water dispenser, crockery, cutlery, cooking utensils, kettle, toaster, electric hob, microwave oven and even a Nespresso coffee machine. Upon request, a high chair can also be set up in the dining room or the kitchen. With a variety of free services, guests can enjoy an exquisitely restful stay at Villa Corail Bleu. For example, guests who stay for a minimum of five nights and more will receive a welcome pack full of goodies. Best of all, guests can also enjoy the services of a housekeeper, who will ensure that the tedious chores are taken care off. Upon request, you can also enjoy additional amenities such as DVD library and the likes. In the common area, there’s also a gym and a green space. Not far from Villa Corail Bleu is found the world-famous SSR Botanical Gardens, which is particularly known for its collection of giant water lilies, unique in the Indian Ocean. A few meters away from your villa, you’ll also find the scenic village of Pereybere, which comes with an assortment of stalls and restaurants.